Nick has been playing the new Zelda game, The Wind Waker HD, for a couple of months now. Henry ADORES watching him play. Not that I can blame him really. I got so into watching him play Zelda Twilight Princess that I would actually ask him to play, just because I liked it. But Henry has developed a die hard love of Link and the Wind Waker story. So much so that Santa brought him his own hat, shield and sword for Christmas. 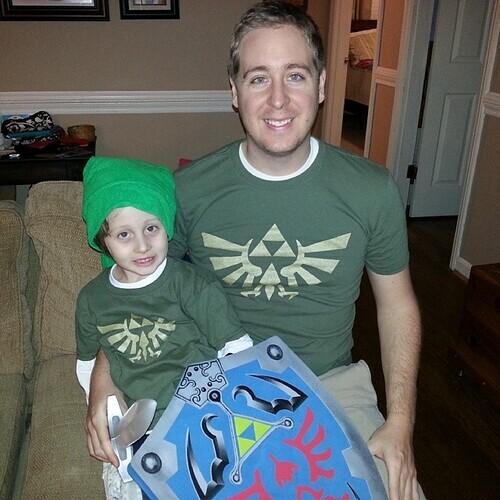 My Aunts also decided to go Zelda themed for Christmas and got Nick and Henry matching shirts. Unfortunately they didn't come in in time for the holidays, but that turned out just fine because my sick boy got the biggest thrill out of his new shirt yesterday. He put it on as soon as possible, and right when Nick walked in from work Henry came in and told him he must get his Zelda shirt on ASAP. Later Henry went into the bathroom and I guess he saw himself in the mirror because we just hear him yell "I LOVE MY ZELDA SHIRT SO MUCH!!!!" He then asked to sleep in it, AND to wear it to school tomorrow. I think we are raising ourselves a second generation Zelda enthusiast. So glad the guys like their shirts! !